Wedding cakes from the iconic Tiffany store can be quirky yet beautiful and sophisticated. 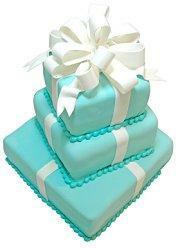 A Tiffany cake for your wedding is an elegant design to cherish on your special day. For more than 150 years, the prestigious Tiffany & Co. has designed exquisite jewelry, including luxurious Tiffany engagement rings, wedding bands, and other bridal jewelry. The company originated the now iconic Tiffany six-prong diamond ring setting to highlight the beauty and quality of their gemstones, and today that prong setting is one of the most popular choices of brides-to-be. In addition to fine jewelry, Tiffany & Co. is also well known for luxurious engagement gifts and wedding gift registry options, and enthusiastic Tiffany fans may even opt to design their wedding cake with distinctive Tiffany flair. Square wedding cakes to simulate Tiffany boxes, either with jewelry box dimensions or of a range of different sizes and shapes. Tiers stacked symmetrically or offset. Tinted icing to mimic the instantly recognizable Tiffany blue shade. Fabric or icing white ribbon accents, either wrapped around tiers or cascading down the cake from a ribbon bow topper. Jewelry-style accents including crystals or pearls. Using a Tiffany cake plate, wedding cake stand, or wedding cake serving set. Minimal wedding cake tops; a simple crystal topper or a bow is often preferred for Tiffany cakes, though simple wedding cakes with fresh flowers used for a topper can also be Tiffany-esque. The key to an appropriately elegant Tiffany wedding cake is to keep the design simple. Tiffany jewelry is not ostentatious or outrageously elaborate; instead, the company relies on superior quality and clean, open lines to accentuate the beauty of its gems. 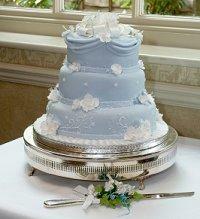 A Tiffany cake, then should be simple with decorative accents and flowers kept to a minimum. The minimalist design can still be elegant, however, and the resemblance to Tiffany jewelry boxes will be instantly recognizable. Choosing Tiffany-blue bridal party dresses or adding the characteristic blue hue to the bridal gown as the traditional "something blue." 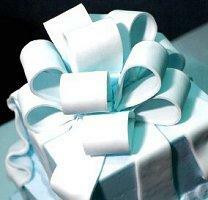 Using blue wedding favor boxes tied with simple white ribbons to distribute favors to each guest. Choosing faux diamonds to use as table decorations, such as scattering them around a candle centerpiece or using a larger faux gem as a paperweight for the guest book. Creating a faux Tiffany cake as the bridal shower cake, or creating an over-the-top Tiffany-themed shower as a fun alternative to other themes. Registering for a few luxurious gifts at Tiffany & Co. while being sure not to overdo expensive items that may give guests the wrong impression. A Tiffany wedding cake symbolizes the luxury, elegance, sophistication, and beauty of this world renowned jeweler, and done tastefully, a Tiffany-style cake can be a stunning addition to a well-coordinated wedding reception.